Even just looking at the picture I can smell these roses. So would you like to have a living fence? I did, and now do. Here’s one that’s guaranteed to grow for you if you’re brave enough. Rosa Multiflora. I don’t know if I mentioned this last year but this time of the year the air in the village where I grew up is scented with roses. It’s true. And I don’t just mean a little bit. Most places you walk you can actually smell the fragrance hanging in the air. It’s quite something to experience. 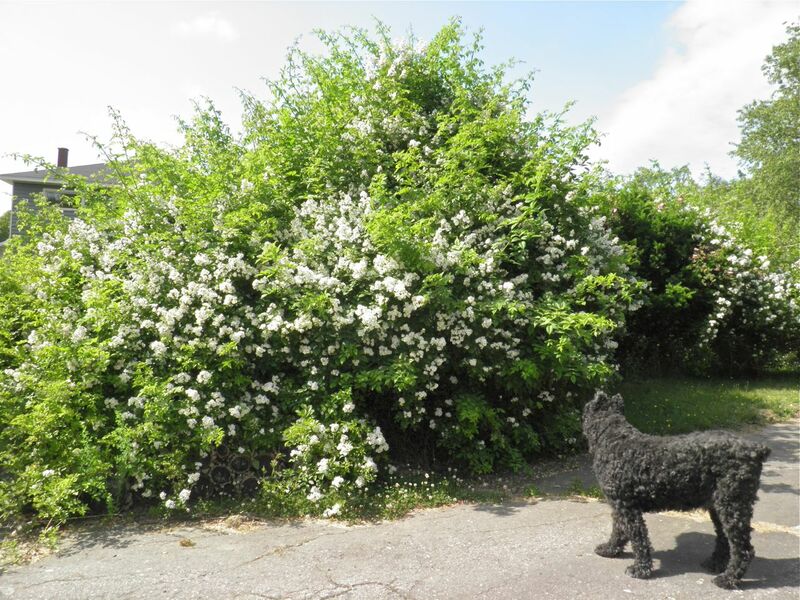 Henry, our Bouvier, gives scale to the size of this rose. Think about it. Not just a corner of someone’s garden, or even their whole garden, but the majority of an entire village. It’s all due to this little beauty: Rosa multiflora. Actually “little” beauty is a complete misnomer. This thing can be huge. I found it a little difficult to find the proper name for this plant when I went looking online. 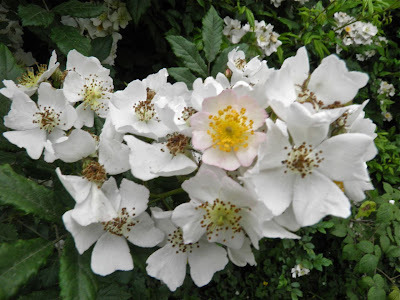 It’s always been “that white, wild rose.” Wild it may be, but “introduced” wild, and also a rampant escapee. Its first appearance on this side of the Atlantic Ocean was about 1860 in the USA. 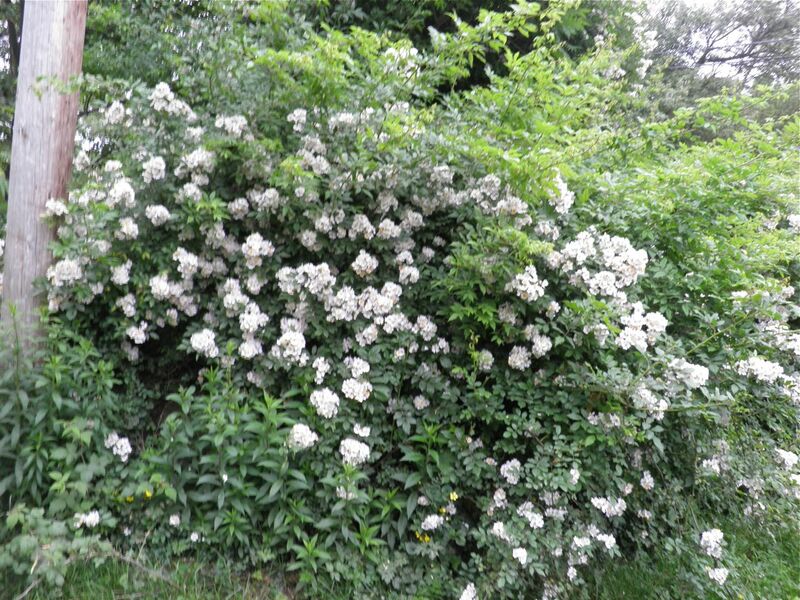 It was imported from Japan for soil conservation, as a natural hedge to border grazing land, and to attract wildlife. The rose had different ideas. Native to Japan, it can now be found from Newfoundland and Nova Scotia south to northern Florida, and west to Minnesota, Nebraska, and Texas. It has also made its way to the West Coast from British Columbia to California. Rosa multiflora has many different names including baby rose, Japanese rose, many-flowered rose and seven-sisters rose. 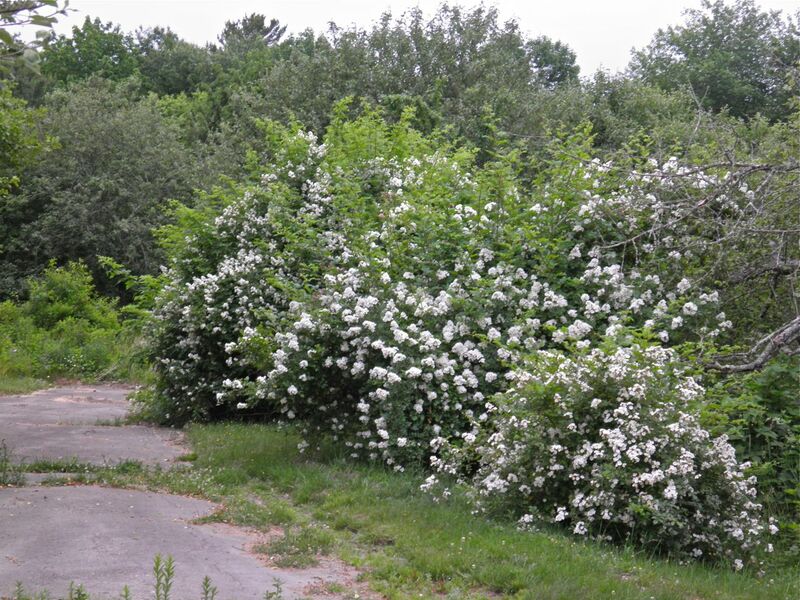 Multiflora rose is a perennial shrub that forms very dense, impenetrable "clumps." Single plants can grow to a height of 15 feet (5 m). The canes originate from the base with multiple branches on each, and arch outward and up. They like to sprawl over or climb up anything they’re close to. My mother has one blooming halfway up an old apple tree. The canes also have recurving thorns which make them nasty to tangle with. They don’t like to let go once they have you. In bloom it is a stunning garden feature. At the end of each branch a flower cluster forms. 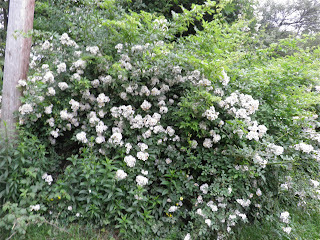 Each cluster consists of many (between 20-100) five-petalled, highly scented, small, white blossoms. The flowers are followed in the autumn by bright red hips that can make beautiful additions to Christmas wreathes, or an entire wreath on their own. I have done both. Sounds good so far? Well, most places that have this plant list it as either undesirable, prohibited, or a noxious weed. I have read the words “forms an impenetrable thicket” several times in reference to this rose. It will also choke out nearly anything else it is close to. This is part of my living fence. It needs some pruning. You can say goodbye to anything growing underneath these plants. In our front yard we are witnessing the battle of the titans right now: poison ivy and this rose. I’m not actually sure which one I’m betting on. 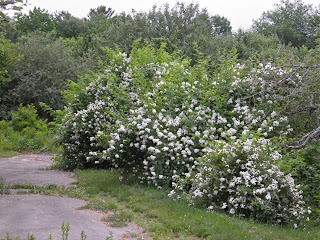 Because of its strong survival instinct it is often used as a root stock for more delicate grafted ornamental roses. And it does perfume the air like nothing else I can think of. If you’re interested in letting an area of your property go “feral” this may just be the plant for you. It does provide excellent screening during the spring through autumn, and I can’t think of a person that would be stupid enough to want to brave a hedge made out if it to enter your property illegally. Mind you, it is a beauty, the birds do love it, and it certainly cuts down on the area you need to mow.